shopnewbalance.com: Nature vs. New Balance Sweepstakes! Nature vs. New Balance Sweepstakes! Enter the Nature vs. New Balance Sweepstakes and you could win an all expenses paid trip to The Banff Film Festival November 2-5 in Banff, Canada! 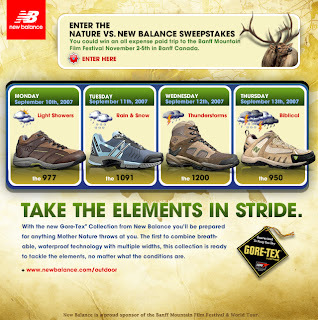 This sweepstakes comes with the introduction of new GORE-TEX® outdoor and multi-sport shoes by New Balance. According to New Balance, the shoes "are the first to combine breathable waterproof technology with multiple widths." You can find GORE-TEX® waterproof technology in the 977, 1091, 1200, and 950 styles by New Balance. All of these styles contain amazing technologies to keep you prepared for anything nature throws at you. And with fall coming fast, is there a better time to try them out?